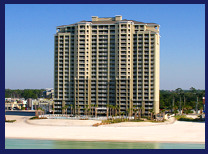 Panama City Beach on the Florida Panhandle is a popular family-vacation destination with a large selection of resort accommodations on the Gulf Coast beaches – find the perfect hotel deal and plan your beach getaway today! Located on the Gulf of Mexico, the Panama City Beach is a resort community on the Florida Panhandle boasts a popular subtropical climate, with an average temperature of 74 degrees. With a yearly average of 320 days of sunshine, visitors and residents are able to enjoy some of the world’s most beautiful white-sand beaches year-round – now is the time to enjoy coastal living with your own condo in Panama City Beach FL.